Are you a big rock fan? In this case, we recommend you to play Jimi Hendrix- a slot with rock inspired theme based on the iconic musician. Jimi Hendrix is a 5-reels slot with 20 paylines powered by Net Entertainment. This game offers to its players free spin features, cash prizes and wilds. 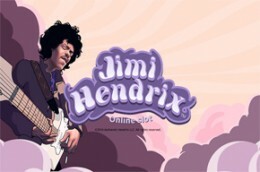 Jimi Hendrix is playable across all devices (desktop, mobile and tablet).